Boulder International Film Festival: PREVIEW: "Nicky's Family"
(Editor’s note: Here’sa lovely guest piece on the engrossing documentary “Nicky’s Family,” penned byKathryn Bernheimer. Kathryn isdirector of Menorah: Arts, Culture and Education at the Boulder Jewish Community Center, as well as the JCC Program Director. 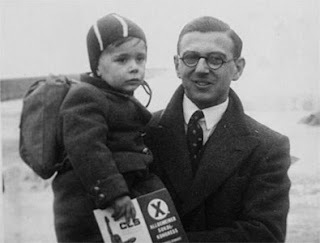 “Nicky’s Family” tells the story of Nicholas Winton, whorescued more than 600 children from Czechoslovakia in 1939. The Kinderstransport, which relocated nearly 10,000 predominantly Jewish children from Nazi Germany to England, is a well-documented and oft-told chapter of Holocausthistory, and there are already several terrific films that deal with thesubject. “My Knees Were Jumping: Remembering the Kindertransports”(1998) was directedby the daughter of a Kindertransport child and narrated by Joanne Woodward. “Into the Arms of Strangers: Stories of theKindertransport,” narrated by JudiDench, won the Academy Award in 2001 for bestdocumentary feature. There is also a companion book by the same name. Thefilm's producer isalso the daughter of a Kindertransport survivor. Local audiences may rememberthe film’s director, Mark Jonathan Harris (a three-time Oscar winner), whospoke at the Boulder JCC a few years ago. There also a British documentary film, “The ChildrenWho Cheated the Nazis,” narrated by Richard Attenborough, whose parents were amongthose who responded to the appeal for British families to foster the refugeechildren. Although the story of Nicholas Winton’s role went untoldfor 50 years, during which time he never even mentioned it to his wife,“Nicky’s Friends” is the third film about the unsung hero – all directed by thesame person. Slovak filmmaker Matej Mináč first told the story in 1999 as a feature film, “All My Loved Ones,” starring Rupert Graves as Winton in this well-made biographical drama. Next camehis 2002 Emmy Award-winning documentary “The Power of Good:Nicholas Winton,” which we showed at the Boulder JCC. “Nicky’s Family” covers the same territory, and while it does not addmuch to the story, it is a very moving tribute to a modest man of great courageand tenacity. Born in a family of German Jewish ancestry that convertedto Christianity, Winton was a 29 year old stock broker who abandoned plans fora ski trip to join a friend involved in Jewish relief work in Prague. Determined to help move children tosafety in England,he embarked on a heroic effort that has earned him a reputation as “The BritishSchindler.” Thousands of people are alive today thanks to his dramatic daring.Winton’s late-life recognition is much deserved, and this film allows us toshare that touching moment. PREVIEW: "Granito: How to Nail a Dictator"